The Dow Jones Transports (transports) have been one of the weakest segments of the market since July. As Charles Dow suggested more than 100 years ago, for the primary trend to be in place we need to see the transports confirm the action in the Dow Jones Industrial Average (Dow). In other words, if the Dow makes a new high and the transports group doesn’t, that is a potential warning sign. Well, on August 1, 2017 the Dow closed at a new 52-week high, yet the transports group closed at a new 52-week low relative to the Dow. In others words, the performance gap, or spread, between the two is at its widest over the past year. 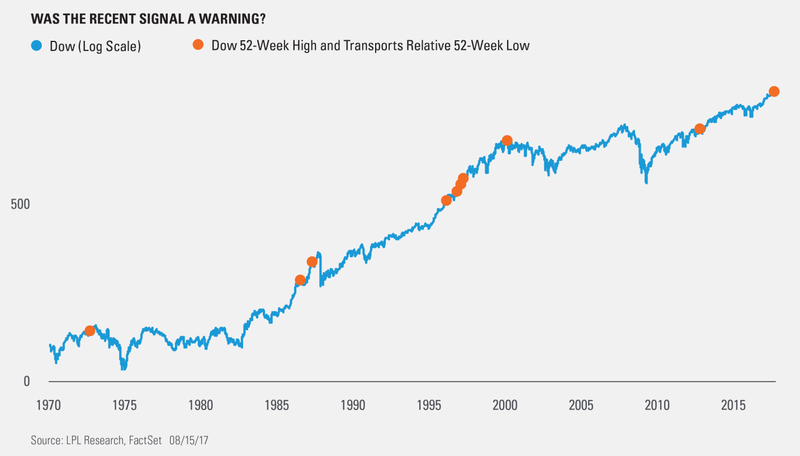 So it would seem transports aren’t carrying their weight; and the question is: Is this a major warning sign? Because of its narrow focus, specialty sector investing will be subject to greater volatility than investing more broadly across many sectors and companies.